Are you looking for a fast fix on the golf course? Probably so. OK, well you’re in luck because I’ve got one for you and it’s guaranteed to lower your score. Here it is…make more putts. Make more pars and birdies and fewer bogeys and others. That advice comes to you absolutely free of charge! Still not satisfied? Well, there is another claim to fast fix for you and it comes from the website www.FastFixGolf.com. If you click on the website, they are running a promo for the new, revolutionary XE1 wedge. We’ve written about the features of the XE1 wedge before at USGolfTV. When visiting the website FastFixGolf.com, you are re-directed to a page featuring the XE1 wedge. And they’re offering a deal—2 for 1 wedges! 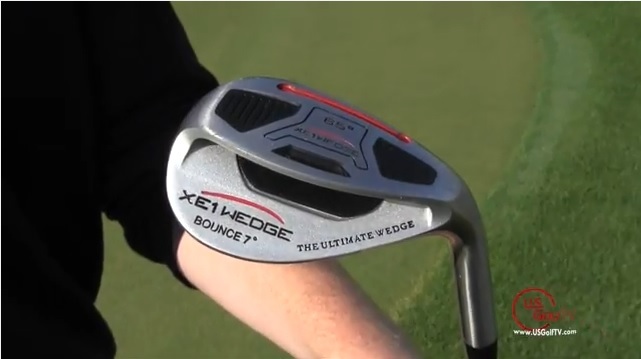 At first glance, the XE1 wedge may not look too unusual. But there are three distinct design characteristics about it I want to cover before you take up this offer. First, is the performance mass is moved back to the rear of the sole. Far more than on a typical wedge. This allows the leading edge of the wedge to stay down as it passes through impact and will eliminate bladed or thin shots. No more watching in horror as your chip shots screams across the green and into the opposite bunker. Second, is what the makers of the XE1 wedge call the “AutoGlide sole.” This prevents the club from digging into the grass or sand. Instead, the club will glide across the ground and the loft of the wedge will toss your ball nice and high. No matter embarrassing chunk shots. Finally, is the loft degree itself. It’s made with 65° of loft. That’s 5 degrees more than a standard lob wedge and 9 degrees more than the sand wedge you’ve got in your bag right now. A lot of amateurs tend to want to “help” the ball into the air. That’s not necessary with your current wedge and it’s certainly not necessary with the XE1. The loft angle combined with the AutoGlide sole is going to get your ball airborne quickly and effortlessly. All you need to do is take your normal stance and address and finish the swing. No need to open the face or try and scoop the ball onto the green. If you go to the www.FastFixGolf.com website you can see a side by side comparison of the XE1 wedge and a standard wedge. The advantages claimed for the XE1 are pretty clear. We discuss more of them in a video review done on the club this summer. Now, if your short game is in perfect order and you can get up and down from any situation off the green, then maybe you should just keep the wedge you have. But if you’ve ever skulled a chip shot, or hit it fat or you’re just happy to get the ball on the green, nevermind if it’s anywhere near the hole, you should think about checking out the XE1. Former PGA Tour pro and current Golf Channel analyst Arron Oberholser promotes the XE1, and on the website you’ll see him extol the virtues of the club to an 18-handicapper. After three shots, he was sold on the benefits and you will be, too. If you go to FastFixGolf.com today and order the XE1 65 degree wedge they will give you a 59 degree wedge at no additional charge. That’s two wedges for just $99. Probably cheaper than a lesson or two at your local club. At USGolfTV, we believe improvement comes through practice and hard work, but equipment with certain features can absolutely find it’s place. If you’re not completely sold, it’s said you can return the wedges with 45-days for a full refund. You have almost nothing to lose except strokes off your scorecard.